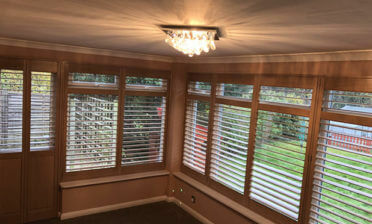 Jamie and Kirk were in our local area of Bromley, Kent to fit some of our shutters to some back doors of a property. This is just one great example of how our shutters can be applied to doors and openings to create a highly versatile and great looking solution. 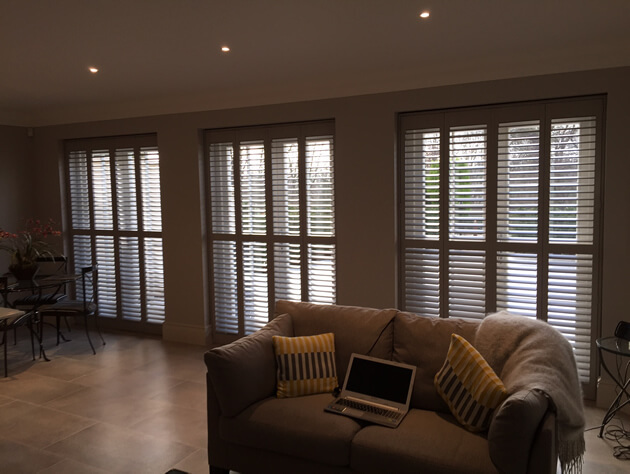 The client was looking to have shutters fitted to the doors mainly for privacy due to other properties overlooking the area, but equally because of how these shutters would help to transform the area of the room. We created all these shutters in a full height style with mid rail which helps with strength and also allows for the top and bottom louvres to be adjusted separately. The material used for this project was taken from our Fiji Range which is a beautiful hardwood made from ethically sourced wood. It features a linear grain which helps allow for really high quality paint or stain finishes. 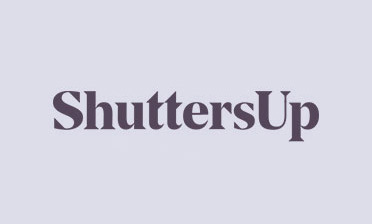 The shutters were created to look modern and minimalistic using 63mm louvres with no visible tilt rods using a system hidden in the shutter panels for the adjustment. We finished the shutters in a fantastic looking Sea Mist paint complete with nickel plated hinges.